We can plaster any room regardless of size or shape, including hallways with high ceilings, to an excellent standard and finish. TM Maintenance are based in Blackpool, Lancashire and cover the areas of Bispham, Fleetwood, St Annes, Lytham, Poulton-Le-Fylde and Cleveleys. We also work with private landlords and small commercial property owners who want an affordable plastering service. If you’re looking for a plasterer, just contact us on 01253 625 015 for a quote. We can usually give an approximation over the phone if you have the measurements. Plastering provides an excellent base for you to work with. You can easily wallpaper or paint over plaster. If you fancy a change, it’s easy! It’s simply a case or repainting or re-wallpapering. Plaster lasts a long time and actually makes your walls stronger. 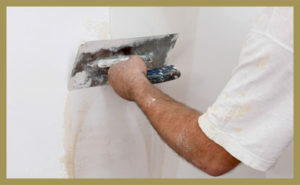 Traditional plaster, applied by an experienced plasterer can last decades if applied correctly. Plastering (when done by a professional) gives an extra smooth finish that’s easy to paint or wallpaper over. Why Use TM Maintenance Plastering Service? We have over twenty years experience of plastering rooms across the Fylde Coast, from living rooms to kitchens and even hallways with high ceilings. We can also strip walls (if required) quickly using expert tools. Finally, we can finish off your project by painting and decorating the room, ensuring a sleek finish. Why not have a look at our painting and decorating page for further details. If you’re interested in our plastering services, just fill in the contact form on our contact page here.